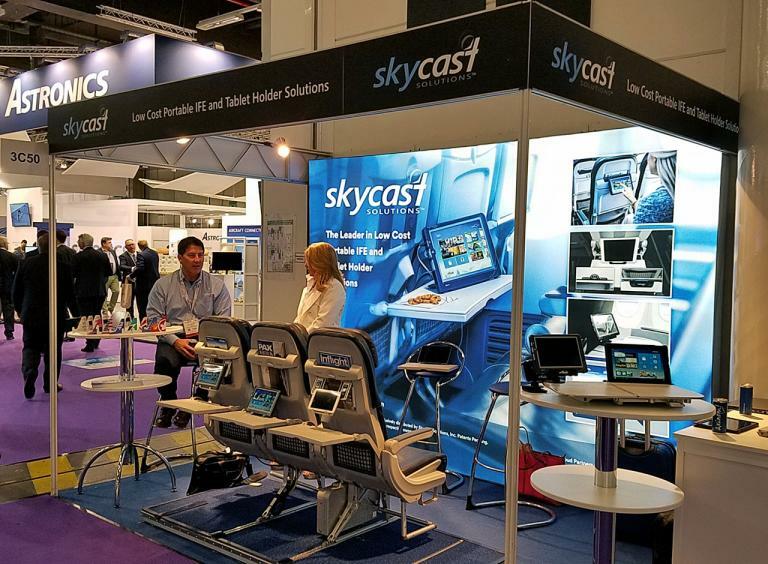 HAMBURG, GERMANY – April 14, 2015 – Skycast Solutions, a leader in portable inflight entertainment and airline tablet holder solutions, today announced at the Aircraft Interiors EXPO that it has developed a very low cost tablet holder solution for inflight use. The “TabCaddyClip™” is custom designed to attach securely to various airline meal trays and provide passengers a convenient way to store and view their personal electronic device (PED). The removable ‘Clip’ is designed to accommodate all sizes of tablets and features an innovative hinge to allow the passenger to adjust viewing angles. The offering provides airlines the lowest cost option to accommodate the flood of PEDs being brought onboard by their passengers. The clip requires no certification or other tests required of permanently installed solutions. If purchased, the passenger can re-use the Clip on future flights. The Clip provides two surfaces for airline branding or advertising sales but is highly customizable for each airline based on their tray and branding requirements.